You may have noticed that I don’t have a whole lot of breakfast recipes around here. It’s not that I have anything against breakfast, or that I don’t like to cook it. It is true, however, that I have no interest in things like blueberry cheesecake stuffed french toast or cinnamon roll pancakes with cream cheese-butter-maple-syrup icing. Those things sounds delicious, but, in all honesty, I think if I ate them for breakfast I think I would either pass out from the sheer force of sugar or, at the very least, not make it til nap time. Of course, it doesn’t help that when I wake up in the morning, I don’t usually have the energy to cook a big meal right away. I just want something filling, tasty, and easily put together to eat while I have my cup of coffee. A crustless quiche fits the bill. We really love quiche at our house. Quiche Lorraine makes a frequent appearance at our house for dinner, along with a salad, and every once in a while, a late Saturday breakfast. But quiche typically involves making a crust, then par-baking it before filling and baking again. While not difficult, that’s a lot of steps for morning, in my opinion. Crustless quiche solves that problem and gets to the point- custardy eggs and yummy fillings. 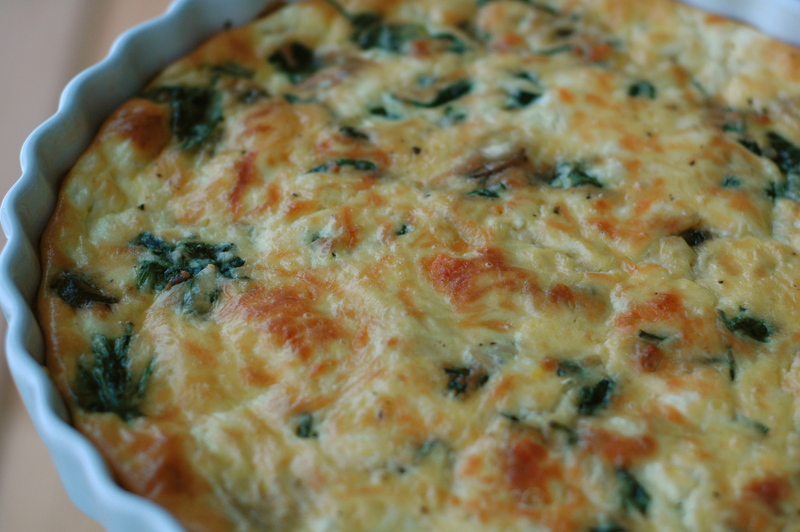 I love the combination of spinach and mushrooms; it works in pretty much everything and doesn’t disappoint in quiche. Feta is fabulous in this. The salty bite cuts the rich egg a bit and adds just a bit of briny flavor without putting you into cheese-overload territory before noon. A sprinkle of mozzarella on top ensures you get that beautiful bubbly brown top. It’s a breakfast fit for a special occasion, but it comes together in just a few minutes. And now I’ve become acquainted with the crustless quiche, I can see this becoming a favorite last minute dinner, as well. Or lunch. Or brunch. You get my drift. Grease a pie or quiche dish with a little extra butter or some olive oil. With a damp cloth, clean off the mushrooms, and then slice them thinly. 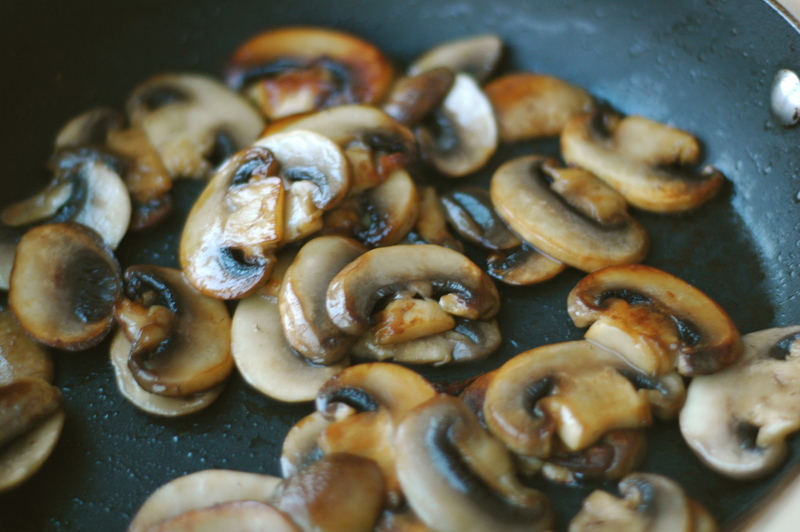 In a large skillet, on high heat, melt the butter and then add the sliced mushrooms. Stirring or tossing frequently, cook until the mushrooms have browned nicely and are a nice golden color, about 5 or 6 minutes. Once the mushrooms are done, reduce heat to low, add in the spinach and continue to cook, stirring, until the spinach is wilted, about 2-3 minutes. Season with salt and pepper generously, to taste. Spread the mushroom-spinach mushroom mixture evenly in the bottom of the prepared dish. Sprinkle crumbled feta cheese on top. In a medium bowl whisk together the eggs and milk. 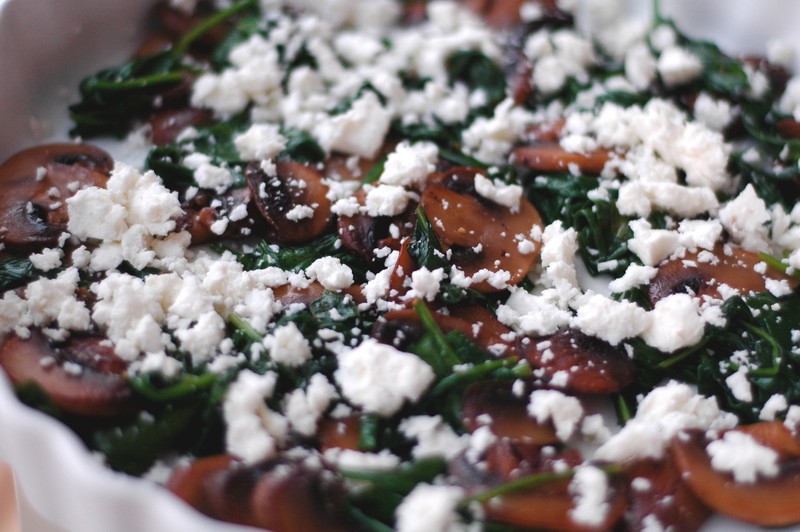 Pour this mixture slowly into the pie dish over the spinach, mushrooms, and feta. Sprinkle the shredded mozzarella cheese over top. Place the quiche into the preheated oven and bake until it is golden brown on top and the center is only very slightly jiggly, 40-50 minutes.